Rentsand prices of commercial space in Singapore fell at a faster clip last year compared to 2015, withofficevacancies rising to a near five-year high since Q1 2012 after some large projects were completed. 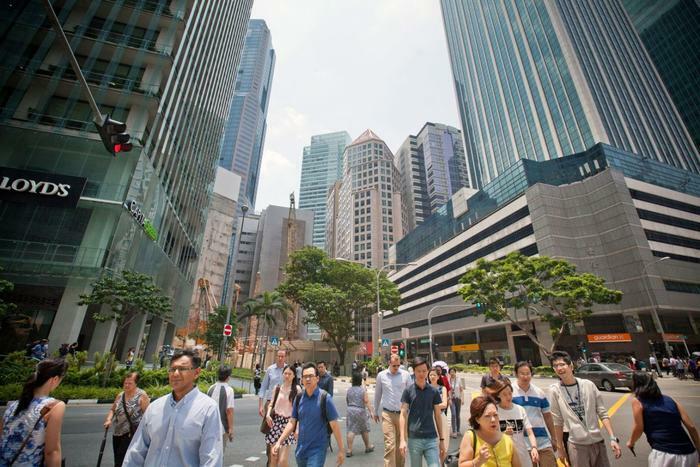 Latest data from the Urban Redevelopment Authority (URA) released on Thursday showed that rents ofofficeandretail spacehave fallen more than 8 per cent in 2016, steeper than the 6.5 per cent drop for office rents and 4.1 per cent fall in retail rents in 2015. The downward pressures are unlikely to go away just yet, given the impending supply and soft demand as the economy stays subdued, analysts say. But prices may be "stickier" as investors buoyed by private capital are still keen to scoop up commercial assets here, particularly offices, amid currently low interest rates. Office rentsfell for the seventh straight quarter, slipping by a further 1.8 per cent during the fourth quarter and fell 8.2 per cent for the whole year. Retail rentsalso maintained a declining streak since the start of 2015, sliding 1.2 per cent during the fourth quarter and 8.3 per cent for the whole year. JLL head of South-east Asian research, Chua Yang Liang said that the weak external economy has continued to dampen the creation of new businesses here, weighing down on new demand for office space. The result was a weak net demand of about 27,000 square metres islandwide in 2016, similar to that recorded during the Asian Financial Crisis in 1998. The relatively stronger net demand in the CBD came at the expense of the outlying areas, he added. Some non-CBD occupiers with expiring leases have moved into the CBD to take advantage of the more affordable rents in these newer and more efficient buildings, Dr Chua observed. An estimated 2.3 million square feet of gross floor area (GFA) in new project completions last year includedDUO TowerinBugisand Guoco Tower inTanjong Pagar. This year,Marina Onewill add another 2.24 million sq ft of gross space and5 Shenton Way(former UIC building) is adding another gross 325,070 sq ft of space. With the completion ofDUO Towerin December, islandwide office stock expanded by 66,000 sq m in Q4 but net demand - going by the change in occupied office space - was only 1,000 sq m.
Cushman & Wakefield research director Christine Li said that this is because most companies that have leased space in DUO Tower and Guoco Tower are still fitting out their premises and have yet to move in. The increase in demand forretail spaceislandwide - going by change in occupied stock - was66,000 sq m in Q4, much higher than the increase in retail-space stock by 10,000 sq m; islandwide vacancy rate fell to 7.5 per cent in the fourth quarter from 8.4 per cent in Q3. Lee Nai Jia, head of research for South-east Asia at Edmund Tie & Company, noted that this could be due to the transactions of older strata-title units inOrchard/Scotts Road, which saw prices maintaining or even increasing. "Notwithstanding this, the prices for strata-titled retail units in suburban districts remained soft," he added. "There were fewer transactions in 2016, as the price gap between buyers and sellers remain wide." Ms Li noticed that some international brands are taking advantage of lower rents to reinforce their brand presence here. These include TripleFit, which occupies 23,500 sq ft of space in Millenia Walk, and Victoria Secret, which opened its 12,000 sq ft flagship store inMandarin Galleryin November. Chinese brands have also entered the market, including fashion label Urban Revivo, which has opened inRaffles Cityand Chinese streetwear brand Hotwind, which has opened in313 Somerset. The retail segment's pipeline consists of total supply of 595,000 sq m of gross space, compared with the 652,000 sq m in the previous quarter. But Knight Frank executive director and head of retail Wendy Low flagged that nearly two million sq ft gross floor area of retail space is slated to complete this year amid heightened caution among retailers. Seeing a "bumpy ride" for both retail landlords and retailers this year, she projects that average rents in the Central Region will fall by 5 to 8 per cent and vacancy to hover around 8 to 10 per cent.